Martin Waugh's Liquid Sculpture is the process of creating shapes by dropping and splashing water, or other liquids. These sculptures are then photographed, since they last only a few thousandths of a second. Creating and capturing these engaging forms requires careful manipulation of the materials and precise control of the lighting and timing. I mostly use plain, clear water, sometimes with a little soap in it. I have experimented with food coloring, as well, and glycerin to increase the viscosity. Milk is a classic material and still enjoyable, and oil is very tempting. Fine art photographs of water drops and splashes. Fine art photographs of water drop art and water splashes. 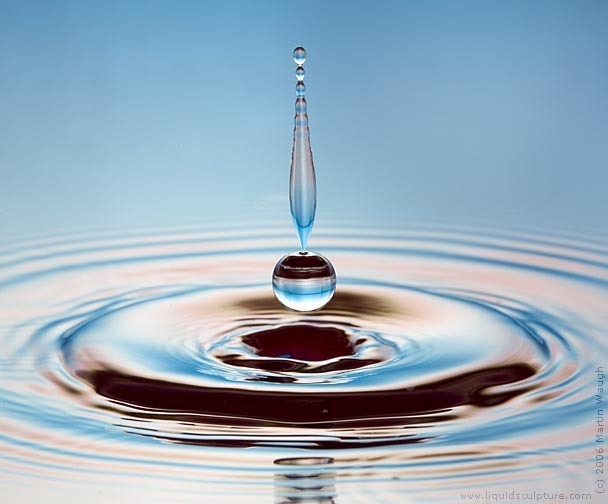 Fine art photography of water drop art and splashes. Photographs of water art and liquid splashes for corporate art. Photographs of water drop art and liquid splash for advertising. Photography of water art and splashes for a company logo. Read about the contents of this site, its art, the artist (photographer), media relations, and photographs. Read about the artist that photographs liquids, especially water drops and milk drops. Read an interview with the artist about what his art means to him and what he tries to convey with it. Read a description of how Martin Waugh is available for magazine and other media interviews. Interior design with water art. Advertise with water splash images. Decorate corporate offices with Liquid Sculpture. Accentuate articles with lively, intriguing liquid photography. Decorate you home with fine art prints in a variety of color schemes. Learn how you can purchase these photographs, as prints, digital licenses, and custom images created on assignment. Learn how you can purchase these photographs, as prints. Learn how you can purchase these photographs, as digital licenses. Learn how you can commission custom images created on assignment. List of people to contact at Liquid Sculpture. Liquid Sculpture in the news.